Located 30 miles north of San Diego, Rancho Santa Fe is home to some of the country's most expensive and breathtaking real estate. Luxury homes featuring top of the line amenities and artistic design, with beautiful floor plans styled in traditionally Spanish, Mediterranean, or Ranch styles are nestled on large, private lots of about two acres with beautiful winding driveways surrounded by lush, fragrant native citrus foliage landscaping. Homeowners of Rancho Santa Fe real estate are granted the pleasure of membership to the exclusive private Rancho Santa Fe Country Club, which features one of the best golf course experiences in the area. 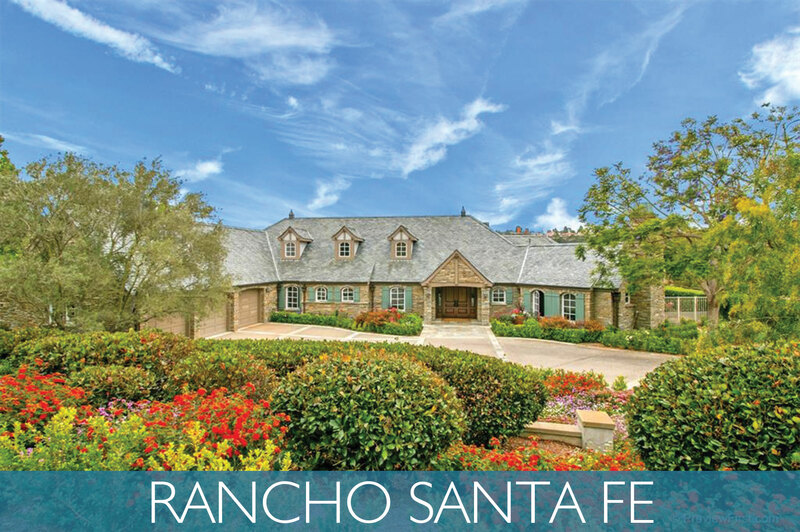 View more about Rancho Santa Fe on Pinterest! The rural feel of Rancho Santa Fe has been carefully planned and maintained, with most properties having a minimum of two acres. There are 26 miles of hiking and equestrian trails and many of the Rancho Santa Fe communities feature equestrian stables and riding. There is no home mail delivery and streetlights and sidewalks are banned from residential areas to enhance the sense of country life. Many of the nation's wealthiest call Rancho Santa Fe their home and the non-existent crime makes it one of the best places to raise a family. Some of the best golf in the world can be found right here in Rancho Santa Fe. The Torrey Pines golf course, open to the public, hosts the Buick Invitational every year, and was the host course for the 2008 US Open. Set against the Torrey Pines National Parkand alongside the Pacific Ocean, you have wonderful ocean breezes with a beautiful view. Occasionally you may even have a sighting of the Goodyear blimp overhead. If you are looking for relaxing, yet challenging pro-level golf, Rancho Santa Fe has a course to fit your needs, wants, and desires. Some courses are open only to members, residents, and guests of those communities. To learn more about the specific golf courses and what neighborhoods they serve, simply contact us. The local schools are outstanding and often receive yearly awards for outstanding student achievement, teacher excellence, and sport performances. Many high school seniors are able to take college credit courses through the local universities as well. Rancho Santa Fe offers the country life in the middle of a city. It is one of the most perfect garden spots in the world, with over 320 days of beneficent sun, low-humidity, and wonderful year round temperatures. The breathtaking blend of pristine sea and mountain air combine to give Rancho Santa Fe one of the most enjoyable outdoor environments in the country. Start your search for Rancho Santa Fe real estate by using the convenient price points located above. To learn more about moving to one of the most private and luxurious areas of the California Coast, simply request our Rancho Santa Fe Relocation Guide or contact us, your Rancho Santa Fe real estate experts.